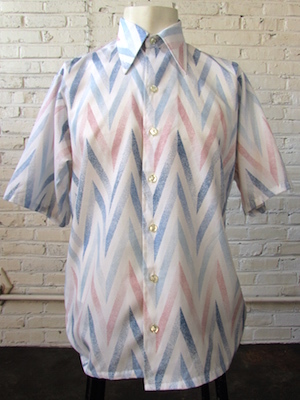 Home > Men's Vintage Shirts > All Men's Vintage Shirts > (L) Mens Vintage 70s Short Sleeve Disco Shirt! Pink & Blue Speckled Zig-Zags! 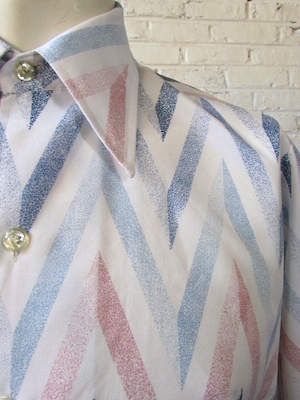 Mens vintage 1970s short sleeved polyester disco shirt! White base with rows of horizontal zig-zagging lines in pale pink, pale blue and a darker navy blue! The colored lines are made of tiny little speckles of color that make them appear as though they are fading into the white of the shirt. Closes in the front with pearly off white buttons. Straight hem with a long, pointy 70's collar! Tagged by JCPenny. No material tag but feels like polyester. Chest: 42" LARGE. Shirt has very little stretch.